Last month Cal State LA Today published an article on one of their students, Amanda Deal, who has traveled with our teams twice to serve in El Salvador. I have known Amanda since she was a young girl in our church. Amanda's mom and I served together on our church staff for many years and Amanda babysat our boys when they were toddlers. It has been such a privilege to watch her grow into a beautiful, godly young woman and to serve alongside her in El Salvador. Amanda first served on our July, 2011 trip, where she became deeply burdened for the teenage girls. That summer I watched Amanda remove her brand new Nike basketball shoes and give them to a nervous teenage girl who owned only one pair of flip flops. I'll never forget that moment. 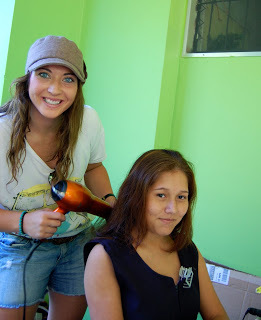 To read the post about that experience, click here: "Giving Away our Shoes" Amanda vowed to return to El Salvador the following summer after Stephanie Keenan, another team member, received the vision to throw a quinceanera for these forgotten girls. And Amanda kept her promise. Amanda played an integral role in organizing the quinceanera this past July, soliciting funds and donations from family members, friends and fellow college students. She organized a "dress drive" at Cal Sate LA and received many stunning dresses for the quinceanera. Most of the girls who participated in the quinceanera had never owned dresses of that quality, style or glamor. To read Amanda's post written on the night of the quinceanera, click here: "Transforming Hearts"
One of the things that I love most about leading orphan outreach teams is seeing the profound transformation that takes place in the hearts of our team members. It has been so incredible to watch God move in Amanda's life as she has fallen in love with El Salvador. I have watched her future plans as a college student evolve as her heart has become broken for "the least of these." She is a gifted athlete and leader and it has been a blessing to be part of her life for so many years. I look forward to watching Amanda shine the hope of Jesus as she serves our hurting world through her gifts, talents and passions. 2013 El Salvador Trip Dates Confirmed!